RAINFALL across parts of eastern Australia since late last week has lifted producer optimism in some areas, pushing the Eastern Young Cattle Indicator sharply higher this afternoon. Today’s EYCI figure reported by the National Livestock Reporting Service was 421c/kg, up 24.5c since yesterday and almost 36c/kg higher than this time last week. The price rise was supported by signs of restocker activity around regions which have picked up some decent rain (see tomorrow’s weekly rainfall wrap), and some big declines in offerings through major selling centres over the past week. Roma store sale today, for example, saw EYCI-eligible vealer and yearling cattle numbers back 50pc to less than 1100 head, contributing to a sharp 37c/kg rise in average price for young cattle through the centre this week. Spectacular price recoveries were also seen in young cattle at CTLX Carcoar, Gunnedah, Scone and Inverell today and yesterday. The EYCI dropped to 385.25¢/kg carcase weight last Wednesday, down 172¢/kg cwt year-on-year and its lowest point since December 2014, as restocker buyers continued to fall away before last week’s rain arrived. 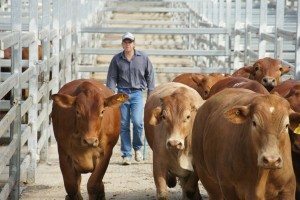 Saleyard cattle indicators have been on a slippery slope over the last few weeks, with most indicators at, or close to, five-year lows. The EYCI’s recent drop below the 400¢/kg mark has been predominantly due to the lack of restocker demand, resulting in an oversupply for processors. For the week ending 8 March, young cattle purchased by restockers and processors were trading at 376¢ and 378¢ respectively, while feedlots operated at the better quality end of the market, and as such were on average paying 426¢/kg cwt. Prior to this week’s rain, restocker buyers have fallen away the most among EYCI eligible cattle.